Winterfell, the ancestral home of House Stark! Desktop statue from the north of Westeros and Game of Thrones. Numbered limited edition of 1,500 pieces. Comes in a presentation box with a certificate of authenticity. This unbelievable Game of Thrones Winterfell Desktop Statue from the north of Westeros is cast from heavyweight polystone and sculpted by artist Kyle Millard. A numbered limited edition of 1,500 pieces, it measures 14-inches long x 10-inches wide x 5-inches tall, weighs 3 pounds, and comes in a presentation box with a certificate of authenticity. 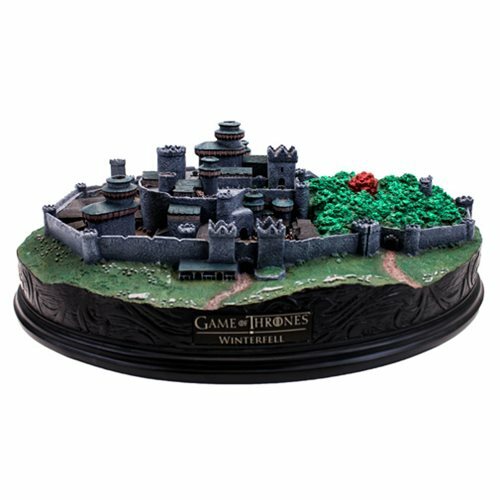 Immerse yourself in Game of Thrones with this remarkable collectible! This Game of Thrones Winterfell Desktop Statue captures Winterfell as a stunningly detailed desktop environment. Many months of creative research was undertaken to develop the piece, and the placement of every element was carefully considered and planned to ensure that anybody viewing it can utterly immerse themselves in it time and time again. Located in the North of Westeros on the Kingsroad, Winterfell is a large castle complex with formidable fortifications and its own Godswood. According to legend, House Stark held Winterfell for over 8,000 years, before House Bolton usurped it and took up residence in the aftermath of "the Red Wedding." The Winterfell seen on-screen in HBO's Game of Thrones is an amalgam of several real-world locations and CGI artistry, seamlessly blended to create one of the series' most enduring locations and what appears to be a very real castle. To create a desktop version of this fan-favorite bastion, the designers over at Factory Entertainment spent over 1,000 hours tirelessly researching every frame of the show in which Winterfell is seen, photographs of the real world locations were also scrutinized and concept drawings and architectural plans were created to help bring it to life. Ages 13 and up.